We recently visited the ancient Italian city Pompeii, famous for being wiped out by the volcanic explosion of Mount Vesuvius in 79 A.D. We’ve already visited many other (possibly more famous) historical sites in Europe, such as the Acropolis and the Ancient Agora in Greece, and the Pantheon and the Roman Forum in Italy, but Pompeii is by far my favorite, and I think it’s going to be hard for anything we visit afterwards to beat it out. The element that sets Pompeii apart from other historical sites is that it is very, very complete. The volcanic eruption preserved a good portion of the city. Therefore, I am NOT walking through a small field of half-broken columns, statues with the noses chipped away by time, and fragments of old pottery on display behind glass. Instead, when stepping into Pompeii, I step onto cobbled streets with the chariot wheel ruts still ingrained in the stone. I walk past old fast-food stalls with the crocks for the hot food still sitting in the undamaged marble counters. The flour grinders stand in the bakeries; the stone ovens wait to be fired up again. 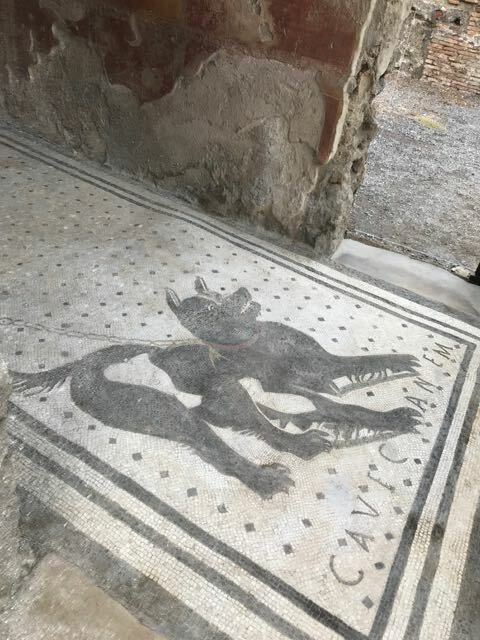 Many floor mosaics lie intact; one reads “Beware of Dog” in Latin. Ruts left in the stone by chariot wheels. Pompeii is quite large, not merely a ruined remnant of city. I walk through many streets, curving back alleyways, major intersections complete with ancient crosswalks. It’s easy to get lost (and I do lose my way several times). A huge amphitheater rests just outside of town, connected by a dirt road, about a five or ten minute walk away. The walls and tunnels to the stage are intact, even though some of the seating has been destroyed. Dad walking through a winding street in Pompeii. 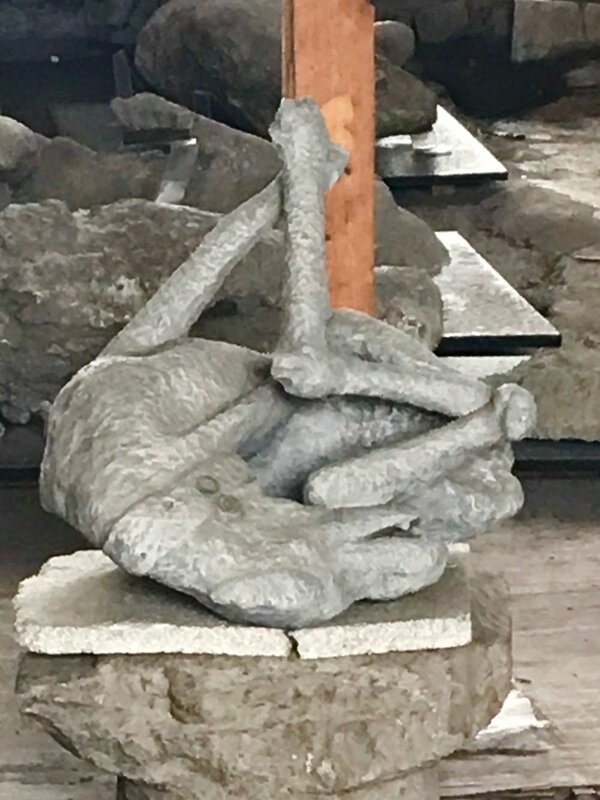 I quietly pass by dead citizens of Pompeii who have been preserved through plaster castings. It’s startling to see the forms of human beings snapshotted at the exact moment of their deaths—some still seem to be writhing, and one appears to be praying. A small boy lies on his back; the toga he was wearing still wrapped around his body, and on a pedestal behind him sits a dog, donning a collar and contorted to make an awful shape. Plaster cast of a (praying?) Pompeiian. Plaster cast of a Pompeiian child. Plaster cast of a dog. The first lines describe the volcano blast slowly destroying the city (the entire eruption actually rained down for about eighteen hours), while the second half references the well-preserved aftermath and how, when visiting the city today, it feels like the Pompeiians still live here, like their togas move amongst the tourists.